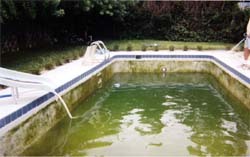 Is Your Pool full of green cloudy swimming pool water and in urgent need of restoration? Are you about to buy a house that has a pool that looks OK - and that the owner says "it's in great condition - we have never had a problem with it"
Do not just believe him because it is very common for people to sell their house - just because they have a fundamental problem with their pool - So you should never buy a house with a pool without getting a pool expert to inspect and report on it. Are you ashamed to show it to your visitors because of it’s dreadful condition? When pools are not properly looked after the water can quickly become full of that nightmarishly green algae and other unspeakable objects, such as dead animals? 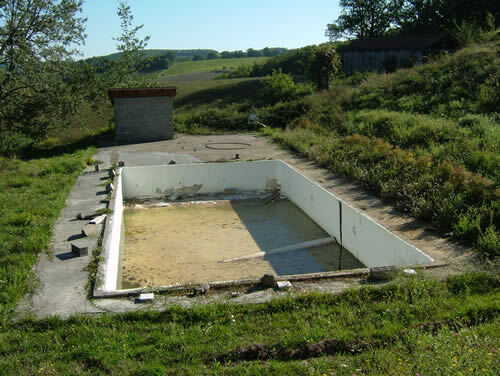 Many pools do get like this and to be frank it is socially irresponsible to have an old pool that has water in it that can trap and kill all kinds of animal and act as a breeding ground for mosquitos. OK so your pool is a bit like one of these – The million dollar question is what can you do with it? This particular pool was one that we surveyed a few years ago - it had been built a few years before the survey - at great cost - and had never been used because it would not hold water! The pool above was actually quite sound underneath! the dreaded green look - just like the pool has been filled with mushy green peas! The Good news is that many pools that look dreadful have a very sound structure. 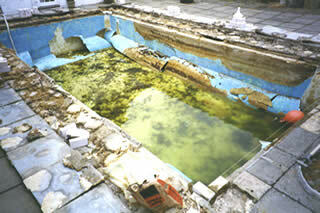 Is so it can be renovated with a brand spanking new liner to put the pool back into sparkling condition. But please remember that renovation of a swimming pools is often more complicated and unpredictable than the installation of a new one. What sort of Pool is it? You probably have no idea what to do with your problem pool. If you have just bought the house, you may not even know what type of pool it is – You may not know whether it is a top notch installation that has been neglected or something cheap and nasty that is possibly even worthless! If it was a top quality pool when it was built it is possible that renovation work might be straightforward and reasonable in cost. On the other hand if the initial installation was a "Let's buy a cheap hole to swim in” you may well be better off by getting rid of it. But even then there may be something that is worth salvaging. What sort of Pools can be renovated? What type of pool have I got and is it worth the cost of renovating it? Why is the type of pool important? A panel pool may only be few years old – but because of the intrinsic unsuitability of this type of construction in clay soil – that is found all over the place both in France and in the UK – it may be worthless. On the other hand a 30 year old concrete pool that is cracked and leaking may be structurally sound and worth saving with a new PVC liner. 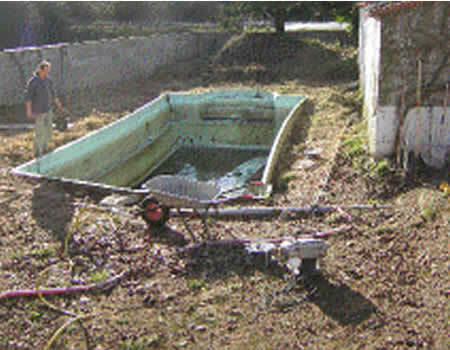 A fibre-glass pool may have “popped” out of the ground – as they are prone to do. It may be scrap – or it might be possible to re-level it re-do the paving around it – at an economic cost. For all types of swimming pool, Commercial, Residential, Indoor, Outdoor, Concrete or Liner, there can be no doubt that the design, specification and finishes have improved dramatically over the past decade. Where the pool tank leaks or if the pool finishes are in a poor state of repair, the most cost-effective solution may be to upgrade the pool circulation system and then install a vinyl pool liner. This will provide guaranteed water tightness and an attractive pool finish that is resistant to swimming pool chemicals and very easy to maintain. Filtration, chemical treatment and environmental control are frequently in need of renovation or upgrade. The energy savings that can be achieved by upgrading to modern pool equipment may also make it worth thinking about.